Just released! 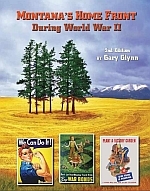 Montana’s Home Front During World War II, 2nd Ed. Look for it in a bookstore near you! This compelling account of Montana’s contribution to the war effort covers personal stories, local politics, industry, agriculture, education, sports, and social life during the upheaval of a world-wide conflict. Montana’s Home Front During World War II is the tale of ordinary citizens who came together to support their sons and daughters overseas, and the tens of thousands of residents who left the Treasure State to serve their country in the military and defense plants. Those who remained planted Victory Gardens, purchased record amounts of war bonds, and endured the hardships brought about by war-time shortages and rationing. This highly-readable account is the most comprehensive look at Montana during the early 1940s, and the tremendous sacrifices made by ordinary people to support their country in time of war. Originally published in 1994, this revised edition of the classic Montana’s Home Front During World War IIincludes many rare and previously unpublished photographs. The training of the First Special Service Force “Devil’s Brigade” at Fort Harrison. The construction of Malmstrom Air Force Base and the Great Falls based Lend-Lease operation to aid the Soviet Union. The experience of hundreds of Italian and Japanese civilians who languished behind barbed wire at the Fort Missoula Detention Center. The hellish fighting encountered in the jungles of New Guinea and the Philippines by the 163rd Infantry Regiment (Montana National Guard). The terrors of night combat as the crew of the USS Helena battled Japanese ships in the treacherous waters near Guadalcanal. Was Senator B.K. Wheeler duped into revealing America’s top-secret war plan, the Victory Program, just days before Pearl Harbor? Did the Soviets run a nationwide spy ring from an Air Force Base in Montana? The answers to these and many other questions are answered in Montana’s Home Front During World War II 2nd ed. Gary Glynn examines in detail the impact of the Second World War on Montana politics, industry, agriculture, education, sports, and crime. Train with the Canadian-American commandos of the First Special Service Force “the Devil’s Brigade” as they become a superb fighting unit at Fort Harrison. Languish behind barbed wire at the Fort Missoula Detention Center with hundreds of Italian and Japanese civilians. Pick sugar beets alongside German prisoners of war and American college students from Sidney to Stevensville. Fight alongside the men of the 163rd Infantry Regiment (Montana National Guard) in the hellish jungles of New Guinea and the Philippines, at Sanananda, Aitape, Wakde, Jolo and Zamboanga. Experience the terrors of night combat as the crew of the USS Helena battle Japanese ships near Cape Esperance and Guadalcanal. Cheer as the 5th Marines raise the USS Missoula’s flag over Iwo Jima. Far from the famous World War II battlefields of European theater and the Pacific, many ordinary Montanans made tremendous sacrifices to support the war effort. Tens of thousands of residents left the Treasure State to serve their country or work in defense plants. Those who remained purchased record numbers of war bonds, planted Victory Gardens, and endured the hardships brought about by war-time shortages and rationing. Available in print and ebook formats.